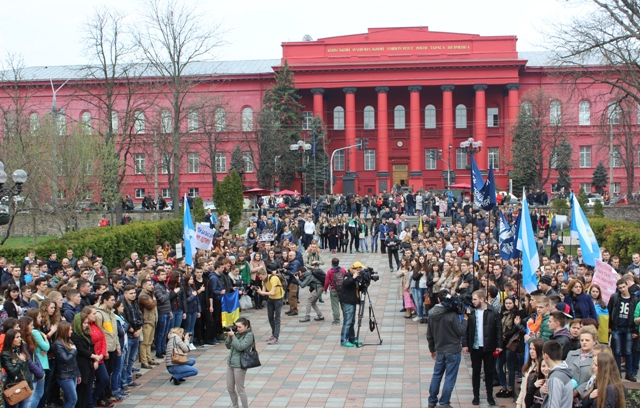 On 7th April n Kyiv, thousands of students participated in the All-Ukrainian Youth Warning Protest Action. The Federation of Trade Unions of Ukraine reports. At 11.00, an All-Ukrainian Protest Action for decent future of Ukrainian students will be held in Taras Shevchenko Park, Kyiv. It started with a rally in the Shevchenko Park near the main building of the Kyiv National University Taras Shevchenko. Students of universities urged the government to stop attacks on their social and economic rights guaranteed by law. Youth need to learn, and the country needs patriots who are its future. Young people walked the main streets of the city – Volodymyrska Street Khreshchatyk Street – to Independence Square and Heaven’s Hundred Heroes Alley where they laid flowers in memory of those killed for Ukraine. The students sang the National Anthem and pledged that they would make every effort to defend their rights, honour and dignity of young generation of future professionals who will fight for a new Ukraine and its entry into the community of the developed European countries.